English language tuition fees if you want to study English in the UK before you begin your course. Before you start, our Admissions team can help you with finance advice and information including the cost of living in London. As a student, our Student Welfare team are here to help you manage your finances. Get support in your country. If you are a student from the EU then you can apply for a non-income assessed tuition fee loan to cover your tuition fees from Student Finance England. This is the same loan that is available to UK students. 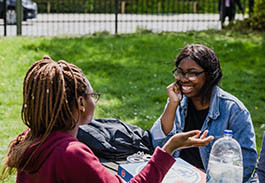 If you are an international student, you'll need to support yourself financially when you study with us as there are no UK Government-backed loans and grants available for you. 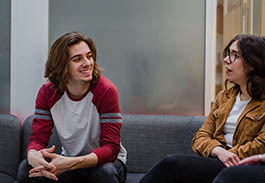 To secure your place at Middlesex University as an international student, you will need to pay a deposit. This will be deducted from your tuition fee due when you enrol. If you choose to defer entry to the following academic year, the deposit will be held for one academic year. When we receive your deposit, we will register you with the UK Visa’s and Immigration Deposit (UKV) and you will receive a Confirmation of Acceptance for Students (CAS) reference number. You should use this when you apply for the Tier 4 or CAS visa. You must pay the minimum deposit before the Tier 4 or CAS visa can be issued. You can also pay your tuition fees in full before your visa appointment and in which case the total fee due will be stated on the CAS confirmation letter or your offer letter. We can only refund money to the account from which payment was made originally. It cannot be transferred to another individual. If a third party has paid the deposit on your behalf, you will not receive the refund. Refunds will be made at the rate of exchange in force on the date the refund is processed. Any charges levied by the receiving bank will be borne by the applicant. If you have begun your studies, any refunds will then fall in line with normal University withdrawal policies. Your tuition fees must be paid when you enrol so you must make sure that you have the appropriate banking facilities in place for when you arrive in the UK. Cheques/bankers draft - make payable to Middlesex University and send to: Student Fees and Finance - Financial Services, Middlesex University, The Burroughs, Hendon, London, NW4 4BT, UK. We do not accept cash as a means of payment. Your tuition fee deposit will only be applicable if you have been provided with an unconditional offer from Middlesex University. There are a number of different ways to pay so read the information below carefully to find the service that is right for you. Our Admissions team is advised of your tuition fee deposit payment within 24 hours, which reduces the time taken to issue your CAS. 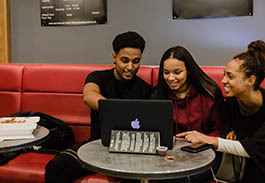 Your login details will be in your offer letter and you will have access to this payment facility upon receiving an unconditional offer from us, unless you are applying through UCAS. In this case you will be provided with access at a later date and should use the bank transfer facility. You may be advised by your bank that your tuition fee payment exceeds your current credit facility or that your card is not authorised for International transfers. We would advise in such instances that you ensure that your card is approved for International payments and request an increase in your credit limit with your bank. To ensure that you do not breach your credit limit you can split your payment into smaller amounts to ensure that you remain within your credit limit. Middlesex University has partnered with Western Union Business Solutions to provide you with a quick and easy way to pay your fees. GlobalPay for Students allows you to pay student fees in the currency of your choice and then provides you with a simple and secure way to initiate payment. Using GlobalPay reduces lost payments and gives you get peace of mind that your full payment is received by us. This service allows you to see the exact cost of your payment in your local currency and the quote given will be honoured for 72 hours. You can then contact your bank to arrange payment or carry out the transfer online. This is easier and cheaper than ordering a bankers draft from your bank and the payment will reach your University account more quickly. You can also track your payment. Log in to the International student bank transfer payment system by using your student number and pin which are detailed in your offer letter from Middlesex University. Your student number is the “M” number and your pin is your date of birth in the format “DDMMYY”. Enter the amount(s) you wish to pay and then select “continue”. You will then be taken to the Western Union website. The payment currency will default to your home country currency but you can select another currency if you wish. The exchange rate will be calculated and displayed. When you are happy with the currency and value of the payment select “continue”. Enter the details of the person who will make the payment (this can be you or a family member or sponsor). Confirmation will be sent to your Middlesex University email address but you can change this to another email address if you wish. When you have entered your details select “continue”. Read the conditions carefully and tick the box to confirm you have understood. Then submit your payment request.Print a copy of the payment instructions PDF and submit it to your bank immediately or use telephone or on-line banking to carry out the transaction. The quote is only valid for 72 hours. If you have not made payment within this time you will need to start the process again. If you do submit a payment after 72 hours, Western Union will process your payment at the exchange rate on that day. If there is a shortfall in the amount received by the University you will be required to pay the difference. Please save a copy of the quote for your records. Upon receipt of your deposit, Western Union will transfer your payment to Middlesex University. There is customer support service to help you at every step. Service is between 9.00am to 5.00pm (UK time) and Monday to Friday only. Service is between 9.00am to 5.00pm (UK time) and Monday to Friday only. Alipay is an eWallet used for over half of all Chinese internet transactions which represents 450 million active unique users making more than 80 million payments a day. Tenpay is the second most popular online payment in China. It works like many eWallet services where you add payment methods (card or bank accounts) to your Alipay account so payments can be easily processed. This is an Australian online debit payment method. It is a payment system that is used by merchants and consumers in Australia and New Zealand and covers 22 banks. This payment method enables immediate online transfer for bank to bank accounts. It is available in the Netherlands, has 3 million users and partners with 10 banks. This payment method allows you to pay via your own bank account. Trustly covers over 130 banks in 21 countries, and have 67 million users. This option enables online banking via the Indian banking network and covers all banks in India. You can also receive financial support to help with the cost of your studies that is based on your personal circumstances. Scholarships and bursaries recognise your academic excellence and other achievements and unlike a loan, you don't have to pay them back. Scholarships, bursaries and awards can reduce your tuition fees or help pay your living expenses. You are only eligible to receive one scholarship award from Middlesex university. Find out about this financial support for international students below. As part of its 80th Anniversary, the British Council in Colombia will be jointly launching with COLFUTURO 15 scholarships of £13,000 to Colombian students interested in pursuing a Creative Industries Masters programme in the UK. Middlesex’s course in MA Creative Entrepreneurship (Music/Media) has been selected as one of the courses eligible for the scholarship. The call for applications is open on COLFUTURO’ s website closes on 28 February 2019. Students do not need to have their unconditional offer by the time the call closes, but they need to demonstrate they have started their application process with the institution of their choice. Results will be published on 14 May 2019. How to apply: When you have an offer from us, then complete our online application form. As an International student, you are eligible for £1,000 - £2,000 towards your course fees for the first year of study. We assess eligibility and funding amounts on a case by case basis. This depends on your course, application and country. How to apply: You should apply for your chosen course through the normal application process. After you receive an offer, fill out the scholarship application form. If you're successful, you'll be notified by email and we'll deduct the award amount from the second instalment of your tuition fees. This award is available to students from Latin America who have demonstrated academic excellence. You must have applied and been accepted to a postgraduate programme at Middlesex University. This gold standard scholarship allows you to study full-time for a one-year design master's programme at Middlesex University. You must be a high achieving student who is a permanent resident in Hong Kong. You will be assessed on your design skills and ability by our academic staff in London and our Regional Director in Hong Kong. The scholarship will fund your tuition fees and living expenses in London for the duration of the programme. For more information, please contact the Hong Kong regional office. You could also be eligible for scholarships, bursaries and awards available to all students - from the UK and outside the UK. For more information about what's available to students from your country visit your country information page or contact your nearest regional office. Many governments also offer funding to help their students to study abroad. Check your country's Ministry of Education to see if there is any assistance available to you, visit your country information page or contact your nearest regional office. There are also scholarships, bursaries and grants for study available from the UK government such as the Chevening Scholarships. Some charities and private trusts also give awards. Visit the British Council website or the UK Council for International Student Affairs website for more information.